Notice is hereby given that, pursuant to section 186A of the Fisheries Act 1996, the Ministry for Primary Industries (MPI) has received a request from The Patuharakeke Te Iwi Trust Board for a 2-year temporary closure to the take of all shellfish at Mair Bank and Marsden Bank, Whangarei. 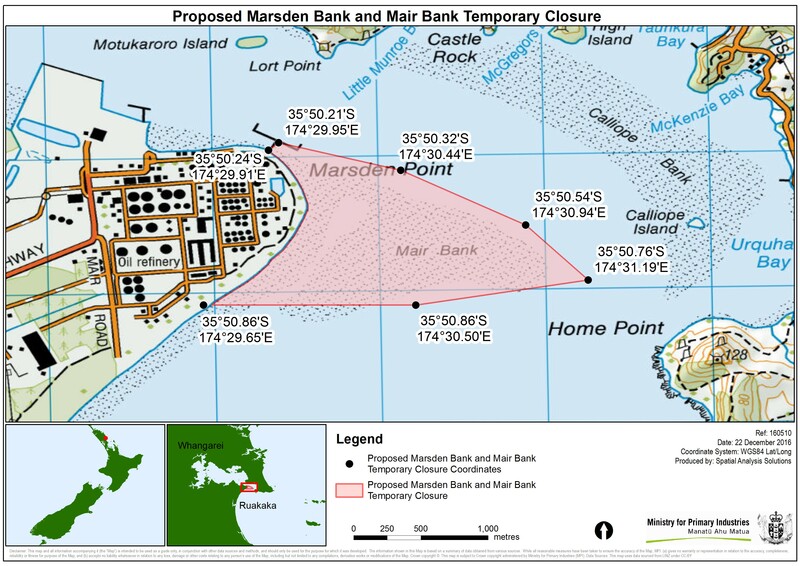 The temporary closure includes all that area of New Zealand fisheries waters enclosed by a line commencing at a point on the mean high-water mark (MHWM) at the base of the Marsden Point oil refinery jetty (at 35°50.24'S and 174°29.91'E); then proceeding in a north-easterly direction to a point at the seaward end of the Marsden Point oil refinery jetty (at 35°50.21'S and 174°29.95'E); then proceeding in a south-easterly direction to the Whangarei Harbour main channel port-hand buoy number 18 (at 35°50.32'S and 174°30.44'E); then proceeding in a south-easterly direction to the Whangarei Harbour main channel port-hand buoy number 16 (at 35°50.54'S and 174°30.94'E); then proceeding in a south-easterly direction to the Whangarei Harbour main channel port-hand buoy number 14 (at 35°50.76'S and 174°31.19'E); then proceeding in a south-westerly direction to a point offshore (at 35°50.86'S and 174°30.50'E); then proceeding due west to a point on the MHWM (at 35°50.86'S and 174°29.65'E); then proceeding along the MHWM in a generally north-easterly then north-westerly direction to the point of commencement. Written submissions in response to this request are invited from persons who have an interest in the species concerned or in the effects of fishing in the area. A public notice calling for written submissions will be placed in The Northern Advocate on 18 January 2017. The closing date for submissions is 27 February 2017.